The obvious starting point is the plentiful carpark at the start of the forest drive through Ballypatrick Forest. Walk back onto the A2, turning left and crossing Bushburn and Alteela bridges, before taking a forest track uphill on the right. The recent heavy dump of snow had left 3-4" of wet stuff which was well trodden through the forest. Much slipping and sliding brought a crossroads in the forest tracks. Options are many and the 1:25 000 map could give hours of pleasure in walking the tracks here. The sunlight tempted me and i turned left to follow a straight path into the distance. The track had been crossed at regular points by animal prints -much fun speculating as to what? The forest drive joins from the left and the tyre tracks of a 4x4 eased the walking in the snow. A track turns off to the right just before a gate and this is followed for over 2km. There are a couple of scenic picnic tables - the first with views to the top of Carneighaneigh (317m) and the second to the more expansive and impressive Knocklayd. I stopped at the first to sit at the picnic table in the surreal scene with snow blanketing the ground. Clearfell brings views of Knocklayd and Rathlin Island and along Glenshesk to the distant northern Sperrins. 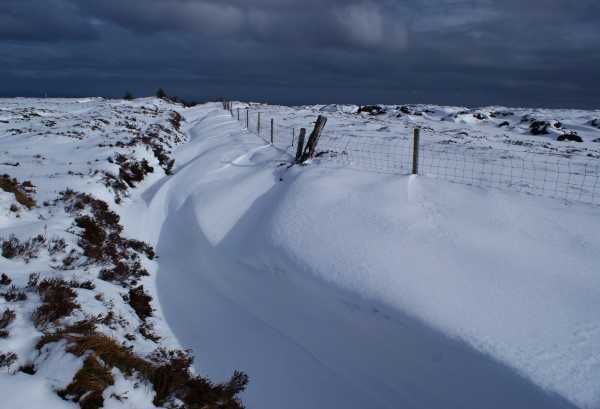 Cross a gate, where the track lay free of prints until three sets of boots sunk into the now easily 6" of snow. A steady rythm brought a strange enjoyment in plodding through the snow. At the end of this track a turn uphill to the left climbs steeply through the trees. The snow became progressively deeper with height, reaching 1ft deep as trees came suddenly to life when thier large burdens of snow succumbed to the rising temperatures of a winter sun. The open hillside come suddenly and brings stunning views north to the north coast. Much attention was taken up closer with the 3-4 ft drifts which filled in and levelled the hillside. This provided great craic to see who would sink deepest when passing over! A compass bearing picked up the fenceline crossing the summit and brought the kink at its highest point. The views were stunning to the arctic looking summits of the other high hills in Antrim, along the northh coast and across to the snow topped hills on the coast of Scotland. The ditch to the side of the fence was impressively filled with deep drifted snow. Top reached in 5km and 1.75 hours.